In part 1 I explained what finally made me replace my iPhone with a Nokia Lumia device. This little write-up describes the basic functionality of communicating with contacts, including managing contacts, instant messaging and e-mail. Importing the contacts was the ugliest part of the switch. Lucky me, I keep my list short and remove contacts that I don’t have contact with any more after some time. Previously, as is most convenient for an Apple user, I had all of my contacts (let’s see how many times I’ll write “contacts” over the next few paragraphs) stored in iCloud. It supports exporting to VCF but importing them to a Microsoft Account only works with CSV files. There exist some tools which do the conversion but they look dubious to me. One could also sync the iPhone with Outlook on the PC using iTunes and then have Outlook sync with the Microsoft Account. Bad luck I don’t have Outlook. Before wasting any more time searching for a solution I just grabbed my mouse and keyboard, opened the iCloud accounts page in one browser window and the Microsoft Account People page in another and started typing away. Funny thing about Apple’s often praised usability: simply copying a person’s account data from the profile doesn’t work. If you cannot mark it you cannot copy it. That means I had to switch to the Edit mode for each and every account in order to be able to copy the values. That was one hell of a time saver… Not! Once that was done, expectation was that all of the contact information is synced to my Windows phone, and it was. If you have all your contact information in Google, there’s no need to perform a manual import. Windows Phone can talk Google, so all you have to do is configure the Google account in the system and you’re done. 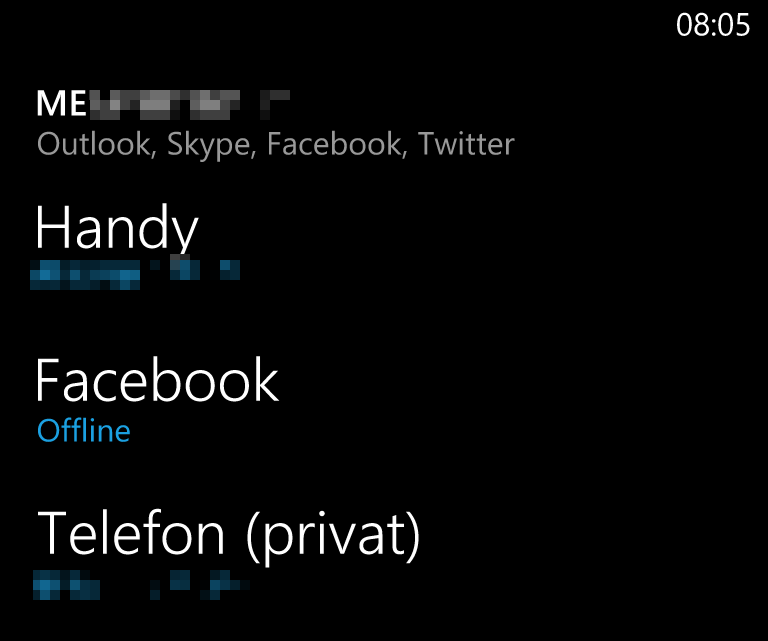 On some occasions the People Hub on Windows Phone showed duplicate entries, e.g. one for the entry I entered manually and one for the contact that is associated with my account via Skype. 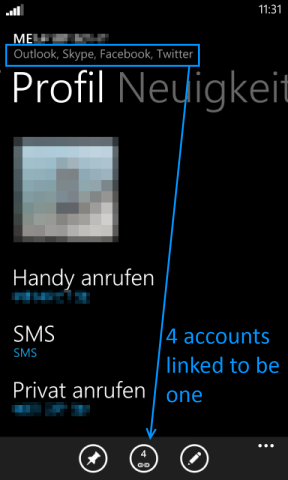 For this, Windows Phone allows you to link two accounts and then the information from both is shown in one. Most of the times Windows Phone figures this out by itself. Since all contacts from all accounts you add to the system are accumulated in the People Hub, this is very convenient. When looking for contacts (until now, including the following, I count “contacts” nine times including the title) there’s only one place to go. No need to check every individual app for the person you are looking for. Getting all my mail out of iCloud was much easier, given you trust Microsoft not to mess with your data. Outlook.com provides a nice feature to import a mailbox from a different provider. All you have to do is specify from where to import, enter username and password for the account (this is where trust comes into play) and off you go. Microsoft’s servers simply sucked all the information from Apple via IMAP and a few minutes later I had all my mails, including the folder structure, in my Outlook.com account. Nice. After that, I changed my iCloud mail settings to automatically forward everything to Outlook.com so I have some time to update all my online accounts to use the new address. Sending and receiving mails with the Outlook app on WP8 is straightforward, so I’ll don’t go any deeper on this topic. When it comes to communicating with your contacts (I stopped counting) Windows Phone is very flexible without installing any additional apps. Of course, being a phone operating system, you can send and receive SMS. But it also supports posting to Facebook, Twitter and LinkedIn. The messaging app even serves as a Facebook Messenger client. Once you’ve configured Facebook in the system and enable messaging, you only need to set your online status to Available and then you can write a new message in the same way you would when composing an SMS. First you select the receiver and then you choose on how you want to send the message, to a phone number or via Facebook. The People Hub shows you all the recent posts of people you follow on any of the above mentioned social services. You can even retweet posts on Twitter or like posts on Facebook and respond to them. Since I am not a heavy user of those services, this is all I need. There is even a special Me section in the People Hub that solely focuses on you, filtering the list of posts to only those that mention you (so I’ve read, I can’t really test that). It also allows you to create a new Tweet and post on your Facebook page. That’s a nice integration, rendering the dedicated apps for casual users superfluous. With a Microsoft Account you also get access to Skype, which, dunno why, is not integrated in the same way as Facebook is. Maybe that changes with WP8.1. I can’t remember if any word has been said about that on the last Build conference. To use Skype you have to install the app. Since it is not integrated like Facebook is, you can’t share links from Internet Explorer using the share menu. Only Twitter and Facebook are available, as well as e-mail through Outlook and SMS. Apple’s share integration with iMessage was much nicer and I really relied heavily on this. One thing I noticed from time to time is that Skype sometimes doesn’t seem to be able to deliver a message to the receiver’s device. When I send one off from my phone and then switch to the iPad, the message is there, which means it’s already on Skype’s servers but it is not reliably forwarded in a short amount of time. Sometimes messages take several hours to be pushed to the whomever I send them to. I had my problems with iMessage as well, but on the phone it was always reliable! From part one of this mini series , I can cross off one of the bullet points about things that I missed. You can pin a contanct to the main screen as a live tile, tap on it to get to the contact’s details and with another tap on the phone number you can start a call. Two taps, just like on iOS (given that the iOS phone-app’s current screen is the favorites tab). So much for contacts and communication, next up is very likely the camera.